Due to Hurricane Isaac, Jon and I took an impromptu week-long trip out of town last week. We arrived back home this past Monday night, and aside from a knocked over bench on our front porch and a saturated Better Homes and Gardens magazine left in the mailbox, we escaped pretty much unscathed. The longer than anticipated vacay was a great treat but also left me lacking in the blog post department. However, today I am finally following up with Part 2 of our California trip (you can view Part 1 here). After we left San Fran, we headed to the lovely Carneros Inn in Napa. It was the perfect choice for a nice, relaxing getaway, and we honestly could not have loved it more. From the well-kept grounds to the amazing service and amenities, we were just wowed every single day. We stayed in one of their harvest cottages (Crane 6) complete with its own private backyard/patio area. The row of cottages in the Crane section. Our "backyard" for the week...with a soaker tub, outdoor shower, gas fire pit, fountain, table and chairs and padded lounger with a heater overhead for the cold nights. They thought of everything! Our indoor bathroom also had a huge tub, 4-head shower and heated floors. The door inside the bathroom shower opened up to the outside shower and could be locked in the open position to let the outdoors in. We also had a coffee and espresso maker in our room. I'm not a big fan of either, but Jon put them to use every morning. Somehow, I neglected to take a shot of the bedroom/living room part of the cottage. What?! But I did manage to get a shot of the view we saw from our bed every day. So serene isn't it? After checking in (and being greeted with a glass of wine), we were escorted to our cottage above and had a little time to relax and get ready before our dinner reservation at FARM-which was located on the Carneros Inn grounds. 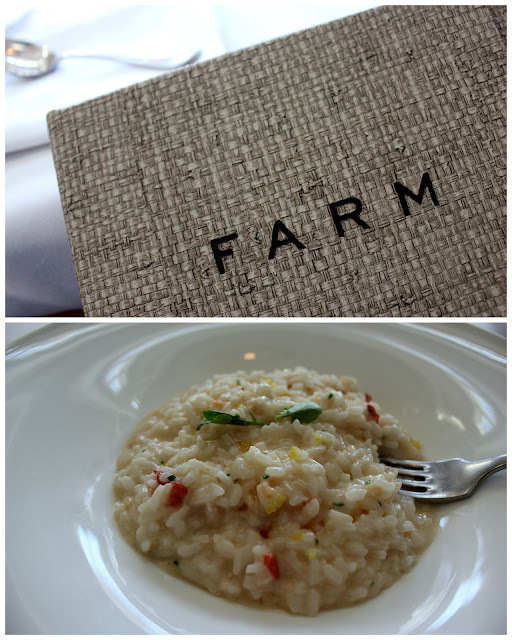 The food was amazing (I had the lobster risotto) and so was the atmosphere--not that I would expect anything less from them. The best surprise of the day was returning to our room after dinner to find a bottle of champagne on ice along with a s'mores kit and note from the General Manager welcoming us to the Inn and wishing us a happy anniversary. It was so incredibly thoughtful and just the beginning of the many great surprises during our stay. More on those and the rest of our days in Napa coming in Part 3 tomorrow!